Tina Flint Smith (born March 4, 1958) is an American politician. 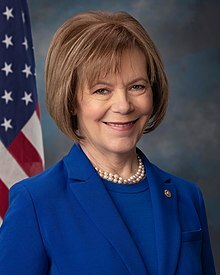 She is the United States Senator from Minnesota upon being appointed by Governor Mark Dayton and office on January 3, 2018. Smith was the 48th Lieutenant Governor of Minnesota from 2015 to 2018. She has been a high-profile member of Governor Mark Dayton's administration and a key participant in legislative negotiations. She is a former Chief of Staff to Dayton. She is a member of the Minnesota Democratic–Farmer–Labor Party. Dayton appointed her to replace U.S. Senator Al Franken upon his resignation, to serve until a special election is held in November 2018. ↑ Belden, Doug (February 4, 2014). "Dayton picks chief of staff Tina Smith as running mate". St. Paul Pioneer Press. Retrieved November 29, 2014. ↑ Grow, Doug (May 9, 2016). "Why there has never been a lieutenant governor like Tina Smith". MinnPost. Retrieved August 12, 2016. ↑ Orrick, Dave (December 12, 2017). "Mark Dayton will name Franken's replacement Wednesday. Here's what to expect". St. Paul Pioneer Press. Retrieved December 12, 2017. This page was last changed on 6 February 2019, at 15:23.